A hoarse voice or persistent sore throat that lasts for weeks may seem like a mild nuisance, but those same symptoms could be early signs of head and neck cancer. 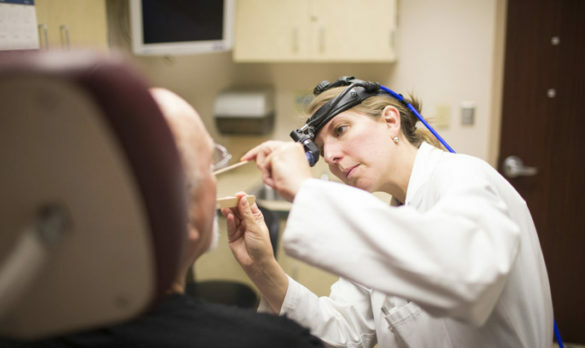 To help patients determine their risk for disease and detect problems at an early stage, the Vanderbilt Department of Otolaryngology-Head and Neck Surgery and Vanderbilt-Ingram Cancer Center will offer free head and neck screenings Friday, April 7, from 9 a.m. to 3 p.m. The annual screening and educational event at Vanderbilt University Medical Center (VUMC) is open to the public. The check-up is offered at no cost and no appointment is necessary. The screening sessions will be held at the Vanderbilt Bill Wilkerson Center, Odess Head & Neck Surgery Clinic, 7209 Medical Center East – South Tower, 1215 21st Ave. South (free parking in the East Garage off Medical Center Drive). Cancers of the throat, lips, tongue, neck, larynx, thyroid, salivary glands or nasal cavity are quite common, but these cancers don’t receive as much publicity as other forms of the disease. The National Cancer Institute estimates that nearly 100,000 individuals are diagnosed with head and neck cancer each year in the United States. In the past, head and neck cancer was usually diagnosed in older patients with a history of tobacco or heavy alcohol use, but today younger patients are developing the disease because they have acquired the human papilloma virus (HPV). This sexually transmitted virus is quite common and is usually shed by the body with no long-term effects. However, in some patients the HPV infection persists and the virus can cause head and neck cancers in men and women and cancer of the cervix among women. During the free head and neck screening exams, physicians check the patient’s mouth, tongue and throat and examine the neck for abnormalities. The exams are painless and take only a few minutes. In addition to the exams, medical professionals will be available to discuss prevention, therapy, research, supportive care and rehabilitation. For more information, call Michelle Pham at 615-936-4896 or email michelle.pham@vanderbilt.edu.